Riva del Garda occupies a spectacular spot, surrounded by sheer rocky cliffs on three sides and the serenity of Lake Garda on the other. it is situated at the northern point of the lake and has played an important role historically. Today it has a beautiful collection of architecture and a maze of streets. The elegant Piazza III Novembre is at the centre of the historic part of town and this area is definitely one of the best places to stay in Riva del Garda. Museo Civico is located in the Rocca, a medieval fortress with quadrangular bastions overlooking the lake. The Chiesa dell'Inviolata dominates the Largo Marconi and is thought to be one of the most beautiful baroque churches in the region. The surrounding area is full of geological sites of interest such Tenno Lake, Lago di Ledro with a paleoethnographic museum and the Varone Falls. Like many of the towns on Garda, the best places to stay in Riva del Garda will have a stunning location overlooking the lake. The LIdo Palace is a five star resort perfectly positioned between lovely Lake Garda and the mountains. The stunning Liberty villa has been converted into a 42 room hotel with contemporary designer flair. There’s a fabulous spa, extensive grounds and a gourmet restaurant. The nearest airport to Riva del Garda is Verona (37 miles). Hiring a car gives you great flexibility when exploring the lake and its surroundings, so visit out online partner Rentalcars to get the best prices. The summer is the best time to visit Lake Garda with the temperatures sitting comfortably in the twenties from May to September. 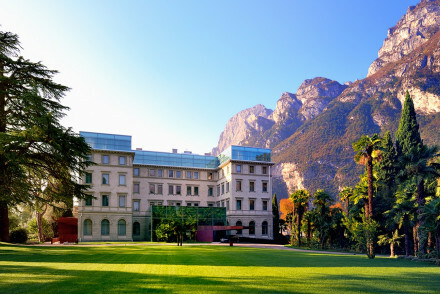 Browse through our list of all the best places to stay in Riva del Garda.